Enquire about your kit today! The Suzuki GSX-R 1300 Hayabusa engine remained largely unchanged from 1999 – 2007, referred to as Gen 1 and post 2008, the Gen 2. Rated at 173 - 197 BHP, this would give the 500 a power to weight ratio of circa 350 BHP per tonne. Put into context this is on par with countless Ferraris, Lamborghinis, Astons and 911s. We feel this achieves and exceeds our aim. The engine is the mainstay of the grass-tracking fraternity in the UK, and prices carry a premium as they are a strong engine with plenty of torque, which is required to move the vastly greater mass of a car over that of a bike. The first generation had a 1299 cc (79.3 cu in) liquid-cooled, inline-4 engine with sixteen valves driven by double-overhead cams. This configuration, technologically unremarkable for that time, delivered a record-setting claimed 129 kW (173 bhp) at the crankshaft by virtue of the largest displacement ever in a sport bike, and a ram air system that forced cool, pressurized air into the cylinders at speed. The Hayabusa engine had an abundance of power throughout its entire rpm band. The 1299 cc powerplant was the largest and most powerful sport bike engine when introduced in 1999, and remained the largest until Kawasaki's ZX14 was released. The Hayabusa's abundance of power at any engine speed made the Hayabusa easier to ride by giving the rider a greater choice of gear selection for a given speed and stunning acceleration. Engine changes consisted of an increase in stroke by 2 mm, enlarging displacement to 1340 cc (82 cu in). The compression ratio was boosted from 11:1 to 12.5:1 and the cylinder head was made more compact and was given lighter titanium valves, saving 14.1g and 11.7g on each intake and exhaust valve, respectively. The valves were driven by a chain with a new hydraulic tensioner. The pistons were made lighter by 1.4g and used ion-coated rings and shot peened connecting rods. The crankcase breather system had reed valves added to control pressure waves in the intake air box, a way of avoiding power loss. Historically the Bike-engine conversions utilised a chain and sprocket setup coupled with an optional battery operated electric motor as a means of providing reverse capability. 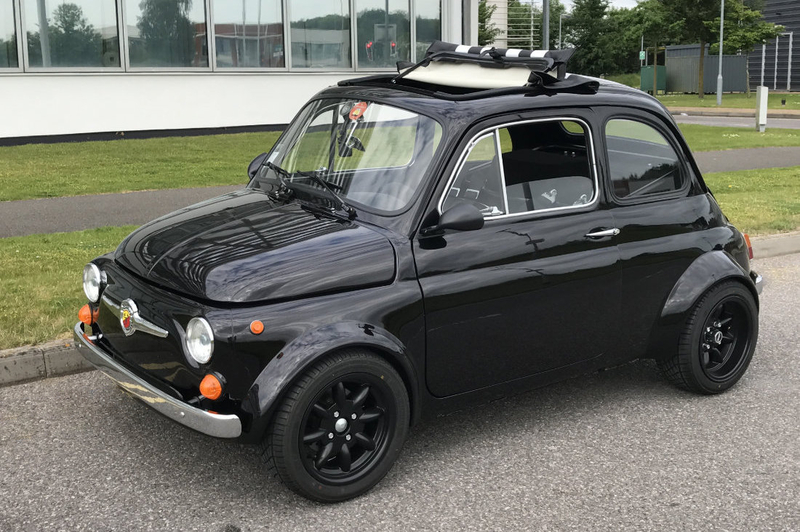 These conversions whilst very popular are very uncompromising and the reverse setup quite crude creating an excessive draw on the electrics, with only the bike alternator on hand to replenish the battery. We first became aware of alternative drive units with the QBA3R as used on the Radical SR series however these units were incompatible with the Minis, as these required a longer wheelbase. Power was transmitted directly from the output shaft via a unique cushion drive coupling. Drive is then taken through a pair of quick-change reduction gears to the Quaife ATB differential. Essentially there was no chain and sprocket, making for a more refined experience, with no chain lash and much lower transmissions losses. An integral reverse gear system is activated by a push-pull cable had a built-in LSD and reverse, the reverse being accessed by means of a lever. We have developed an actuator kit to complement the unit where forward and reverse are accessible with a button, so the car can be manoeuvred with progressive throttle. There are safety features available too, to prevent accidentally engaging or to limit the extent of a passenger’s curiosity getting the better of them! In 2013 Z Cars approached Quaife to develop an equivalent unit to the QBA3R suitable for the Mini. With the wheelbase being shorter, the unit necessitated a more compact arrangement whereby the drive could not be inline as with the 3R but instead requiring a 90° angle to bring the drive into line with the hubs to reduce the driveshaft angle. Furthermore this allowed for driveshafts of similar length. This culminated in the development of the QBA11R. Whilst the unit is transformative in terms of refining the Bike conversions. Insofar that Z Cars are promoting the game-changing appeal of the QBA11R unit, we are nonetheless realistic - when combined with a Hayabusa engine, and the kit itself, the hardware costs of the conversion begin to challenge the romance and adoration that is attached to the Bike conversions. With this in mind we will also offer the Quaife QBA2R, which whilst a chain-driven drive unit offers with an integrated LSD and reverse. We have an actuator kit too. Subsequently we believe the usability of the progressive reverse, without compromising the electrics, supports the view to discontinue the legacy chain/sprocket drive setup. Fully welded ROPT510 tubular engine cradle with engine mounting brackets. Trailing arms and fully adjustable suspension with coilover dampers. Driveshafts, CV joints and rear brakes. Front subframe with double wishbones and fully adjustable suspension using coilover dampers. Steering rack (optional column). Front hubs, uprated brakes and calipers. Quaife QBA11R-type gear drive system, Ford Lobro, mounting brackets. As an upgrade to the brakes included in the Fiabusa kit, we have developed a big brake kit with 260mm vented disks and Wilwood 4-pot calipers. The exhaust is a 2.5”, 4-2-1 setup where all the gasses flow through 2 silencers. Essentially, we have developed a quieter exhaust system so we can be sure the conversion can be ultra-stealth if that is the preferred option. We can easily give the exhaust note more attitude with a switch of silencers or using just one. We have an electric heater kit which offers immediate heat from the initial engine start-up. Thermostat controlled from a remote digital display that can be fitted anywhere in the car, and a sensor which disables the heater unless the ECU detects the engine is running to stop the heater draining the battery. "There’s nothing quite as enjoyable as truly ragging a car and when it talks back to you, and when you can do that within the realms of safety. For me that's when cars are at their best. 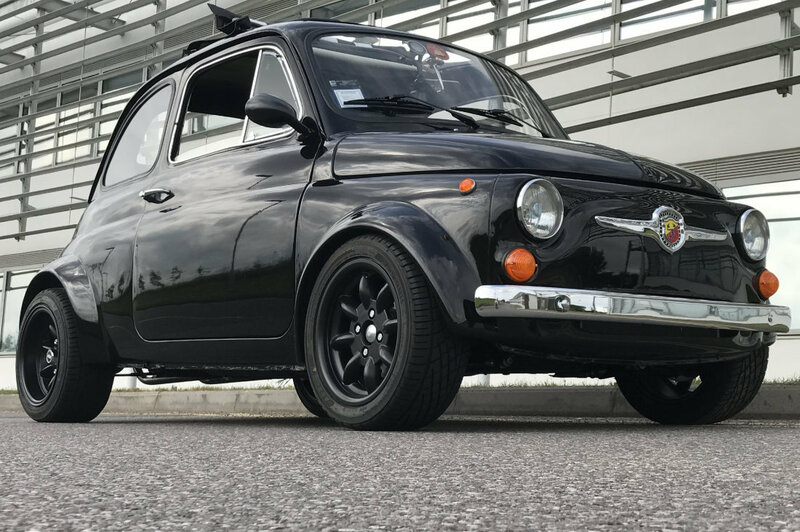 These cars are amongst the best exponents of that art form"
The conversion exemplifies the concept of incorporating innovations or advancements in automobile technology since the inception of the Fiat 500 to enhance the performance, comfort and safety of the classic car. The kit centres round an engine cradle which the Hayabusa engine is mounted into. The QBA11R is then bolted to the engine courtesy of two bespoke brackets. 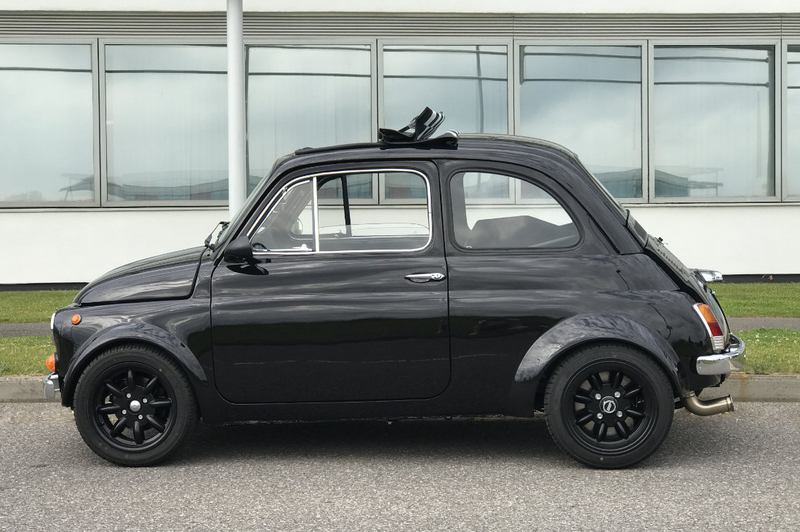 The frame assembly is a self-contained unit, which bolts into the Fiat 500’s original mountings to simplify the installation. The frame also hosts the trailing arms, brakes and suspension. The cradle has pick-up points for the suspension and trailing arms which essentially means the kit (with the engine mounted) can be easily assembled or disassembled (e.g. for engine maintenance). The conversion necessitates the removal of the rear seat upright and base to make room for the engine cradle. A bulkhead will be required to enclose the engine. We can supply a purpose-built bulkhead, which can be upgraded to further sound deaden and thermal insulate the passenger cabin. The kit essentially includes all an owner would need to convert their car, assuming they have a donor car and Hayabusa engine. There is a gear change and lever mechanism and we are looking to have an electronic method to engage reverse to avoid having a second lever. Imagine a simple switch which says F (forward) or R (reverse). The dramatic increase in performance necessitates an uprating of the front suspension, with cross-drilled solid disks. Having tested the more powerful Hayabusa which has the brakes with this configuration, we feel this would be up to the task. If we wanted to upgrade, we would change the pads for a harder material and add a servo. The steering box is replaced with a Mini quick rack and gives better feel and gives the driver more confidence that the quicker steering would facilitate more control given the performance capabilities of the conversion. This addresses the ponderous, vague steering of the original set-up. The switch to a water cooled engine means a front mounted radiator would be required. 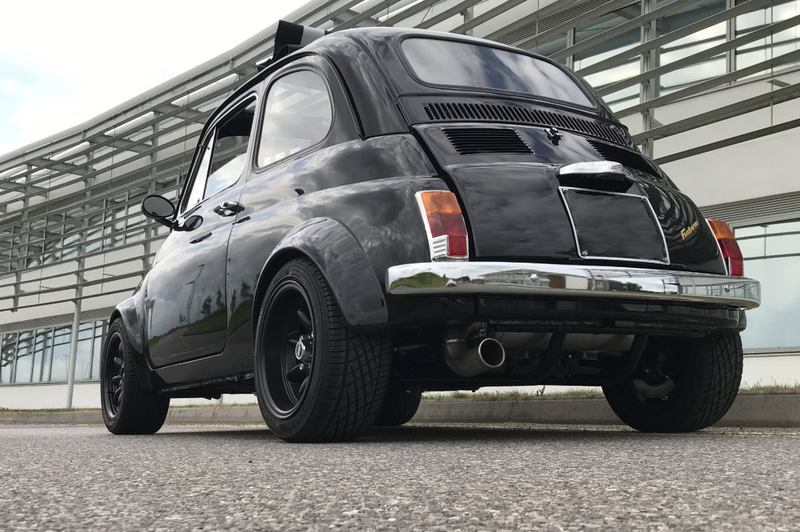 We have chosen to not be too aggressive on the cooling risking overcompensating for air flow through the radiator with a more pronounced aperture or front grill, which can detract from the look of the 500 in our view. For the initial testing, we have a subtle opening near the bottom of the front panel disguised with the front bumper mounted in front. The testing we have carried out to date has admittedly been conducted in 10-15° temperatures, nevertheless the gauge has read normal, so this would suggest the bumper is not acting totally as a barrier. Should the temperatures rise with warmer weather, we will introduce a body colour air dam/scoop to direct air from under the bumper through the opening. There is also the option to add a second fan ensuring a greater surface area of the radiator would have fan-assisted air passing through it in traffic and warmer conditions. A removable element of the front panel, for Summer, and quickly replaced for Winter or if the car was as a show, and the looks of the car were required to be preserved. An opening also behind the chrome centre-mounted Abarth badge/strip. The badge would in-effect be ‘floating’ and act in a similar way to lower opening/bumper, where the badge would distract on-lookers from the aperture behind, whilst allowing more air to pass through the radiator. The radiator shroud ensures all the air that passes through the aperture is not wasted and cools the radiator before being diverted away from the fuel tank and out underneath the car reducing heat soak. The filler cap is attached to the radiator as being a boxer engine conversion, the cap will be the highest point and will avoid air locks in the cooling system. Although the radiator is excluded from the kit, this is to ensure we have the correct cooling solution for every customer, so we would expect the customer to specify their requirements and offer a bundle price for the full kit and the cooling kit. The vents already in place for the air cooled 500 setup allows for the natural venting of the warmer air out of the engine compartment which is an advantage over the Mini conversion. This nullifies to a greater extent the spiralling effect of non-recirculating air stuck in the engine bay steadily increasing in temperature, making the radiator having to work that much harder.to a greater extent the spiralling effect of non-recirculating air stuck in the engine bay steadily increasing in temperature, making the radiator having to work that much harder. The wheelbase is increased by around 37mm to accommodate the QBA11R and to allow more room between the front seats and the exhaust manifold. The more air between the manifold and the bulkhead, the better the thermal management with less heat transfer between the engine compartment and the passenger compartment. The increase of the wheelbase by virtue of the rear wheels being further back towards the rear of the car, leaves the rear wheel offset within the wheel arch which unsurprisingly looks out of sorts. With this in mind, a set of arches will be provided as part of kit which can be used at the owner’s discretion. Alternatively the owner can choose their own solution to centralise the appearance of the wheel within the wheel arch. Arches like wheels are after all, very subjective. The bulkhead can be carpeted and sound-insulated. We have considered carefully what is included in the kit and the parts or components that we have appeared to regard as discretionary. In the main, the supplementary kits or a variation of them are required to complete the installation. With international interest exceeding that of our home market, each region represents different climatic conditions and vehicle licencing regulations such as the dBA levels on an exhaust. We can provide the kits and bundle them in with the main kits, and can produce a bespoke kit, such as a larger radiator for a warmer climate or increase the tank size for a longer range between fuel stops. Personally I don’t mind stopping for fuel as it is a great opportunity to show off my car! In respect to the exhaust, if we are given a particular target dBA, we can manufacture one and fit it on one of our engines to test it to ensure we are at the correct level. - I consent to my data being retained by the site owner after my enquiry has been processed.